DF-BOX, THE INSPIRATION OF IT COME FROM CAR KEY. FEATURES THE BEST TASTE WITH ITS CERAMIC CORE AND VARIABLE VOLTAGES. IT USES SIMPLE, COOL, CLEAN DESIGN TO CREATE THE BEST VAPING EXPERIENCE. The ConSeal V is an oil vaporizer wax unit. This one has an adjustable wattage. 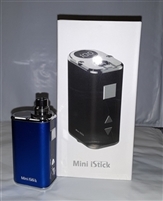 The mystica VV is a new and improved Mystica device now designed with variable output voltage for full control over the quality of your aroma. It also features a preheat mode that will help to warm up the attachment before use to prevent clogging.